I was glued to my desk for about 10 hours straight today. Finally with little daylight left, the sun below the horizon, I ducked out for a walk on the rail trail before heading home. 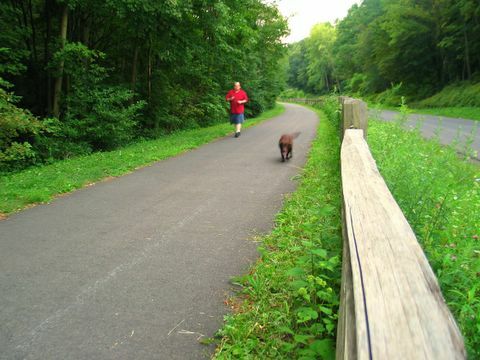 The Harlem Valley Rail Trail runs from Wassaic, NY, up through Millerton, about 11 miles now. Soon it will be extended another 20 miles north. It's a wonderful recreational resource and draws people from all over the region. Tonight, the air was soft, the cicadas and katydids were quietly chirping, and only a few people went by in the half-hour I was out on the trail. What a wonderful green corridor! I fully support any walking/riding trails, I just wish mine was a touch closer (and as green as this!). how wonderfully green it is there it remembers me of Holland.